We’ve just heard Doctor Bulls Grownd composed by John Bull, the first Gresham Professor of Music. Bull was born in about 1562, in Radnorshire (now Wales) and died in Antwerp in 1628. The work is preserved in a single late-17th-century volume of English keyboard music, in the collections of London’s Royal College of Music. In this, the first recording of the volume, we heard RCM harpsichord professor Terence Charlston playing a spinet by made here in London in the 1680s, by Stephen Keene. This instrument also resides at the RCM, in the Museum of Instruments, and you can see it on the current slide. This recording was featured recently in the Secular Spaces division of the Baroque: Style in the Age of Magnificence exhibition at London’s Victoria and Albert Museum, as part of our collaborative ‘Listening Gallery’ project. The spinet is certainly amongst objects that would have been found in domestic spaces at that time. Like the instrument, the volume itself is a real treasure, containing collections of both preludes and fugues, and preserving music dating from before the English Civil War of 1642-1651, by William Byrd and Thomas Weelkes, as well works by later composers like Matthew Locke and John Blow. We heard one of two Grounds in the volume by John Bull. Whilst keyboard music forms the most significant and extensive of Bull’s surviving compositional legacy, it is nonetheless difficult comprehensively to assess this corpus of works, due to the untrustworthiness of many attributions. We’re not sure who owned this volume, but it is certainly representative of the collections of music, often called ‘virginal books’, that were used to teach players in the late 17th century. The most famous of such books is probably The Fitzwilliam Virginal Book, which pre-dates the RCM volume by about 100 years. That treasure resides in Cambridge, as does the current Gresham Professor of Music, Christopher Hogwood. I’d like now to tell you something of the history of The Royal College of Music. Founded by Royal Charter in February 1882, under the Presidency of The Prince of Wales (later Edward VII), the College moved to its present site on Prince Consort Road in South Kensington, opposite the Royal Albert Hall, in 1894. The building you can see in the slide was designed by Sir Arthur Blomfield. Today, the Royal College of Music has over 660 students from 54 countries, studying at undergraduate, masters or doctoral level. And, the College enjoys the distinction, unique amongst British Conservatoires, of being able to award degrees in its own right. ‘Albertopolis’ was a nickname first used in The Times in April 1860 to describe recent developments in South Kensington and the Exhibition Road area. In 1851 ‘The Great Exhibition of the Works of Industry of all Nations’ was mounted in London’s Hyde Park, from May until October. The exhibition was hugely successful. Seen by over 6 million people, it made a profit of over £16 million in today’s money, largely due to Henry Cole, a prominent member of the Civil service and member of the Royal Commission for the Exhibition, which had been founded by Queen Victoria in 1850. Prince Albert, Prince Consort, President of the Royal Commission, was keen for the legacy to continue, suggesting that the profit be used for the purchase of land to establish an area dedicated to science and art, and the education of the population in these fields. The Kensington Gore Estate and surrounding lands, some 86 acres, were subsequently purchased. The so-called New South Kensington Museum opened in 1857, becoming, in 1899, the Victoria & Albert Museum. Cole, by then Sir Henry Cole, was the first Director of museum, and a driving force in the flourishing of the Albertopolis vision. As well as the V&A, this now includes the Royal Horticultural Society Gardens, Natural History Museum, Science Museum, Royal Albert Hall, Albert Memorial, Imperial College (formerly Imperial Institute), Royal College of Art, Royal Geographical Society and, of course, the Royal College of Music. The Commission lasts to this day, as a grant-making educational trust, under the Presidency of His Royal Highness, The Prince Philip, Duke of Edinburgh. Since 1853 Prince Albert had been keen to house a musical establishment in South Kensington. Unsuccessful attempts were made to move the Royal Academy of Music, established in 1822, to the area. However, the Prince Consort and Henry Cole wanted the South Kensington institution to be nationwide in scope, and open to all, with provision for scholarships. This did not accord with the nature of the Royal Academy of Music, which took private fee-paying students. The Prince died in 1861, but by 1865 Cole had founded a committee with a view to establishing a National Training Scheme for music. By 1873 the committee had decided to establish an independent music school, to be known as the National Training School for Music. From 1875 this School was housed in the now Royal College of Organists building, which still stands today, near the Royal Albert Hall. A Royal Charter of 1882 established it as the Royal College of Music. (c) generally the encouragement and promotion of the cultivation of music as an art throughout the world. Sir George Grove was knighted in time for the May 1883 opening of the Royal College of Music, and became its first Director. He had been a member of the College’s Council since 1881. Grove was born in 1820, and trained as a civil engineer. His mother’s musical interests, however, were to have a considerable impact throughout Grove’s life. It was around the 1850s that he first developed the idea of compiling a dictionary of music. Also, at this time, he came into close contact with members of the 1851 Royal Commission. Grove’s association with the Macmillan publishing house began in May 1868 when he became editor of Macmillan’s Magazine. Work on his music dictionary officially began in September 1873, and the first of four volumes appeared in 1879. Grove’s legacy continues in print, most recently published in 2001 by Macmillan as the second edition of The New Grove Dictionary of Music and Musicians, and electronically, through Oxford Music Online. Having outgrown its premises by 1887, the Royal College of Music was offered land on the west side of Exhibition Road, plus the sum of £30,000 towards a new building. The College and members of the 1851 Royal Commission decided on the current site on Prince Consort Road. The result of the commission, given to Sir Arthur Blomfield, is the current red brick building, in the French Baronial style. Here’s a photograph taken on 8 July 1890 at the time of the laying of the foundation stone to the Blomfield building. It shows Sir George Grove and his RCM professorial staff (as the teachers are known). The next slide shows the completed building, and a view of Prince Consort Road, which had been decorated to celebrate the official opening by The Prince of Wales on 2 May 1894. Since its foundation, the Royal College of Music has played a significant role in public engagement, as a major player in the Albertopolis cultural quarter. An embodiment of the RCM’s commitment to the Albertopolis vision was the appointment, in 2007, of the eminent scientist Professor Lord Winston as Chairman of the College’s Council. The Royal College of Music has always been linked with the Royal family. Our patron is currently Her Majesty, The Queen and, since 1993, His Royal Highness, The Prince of Wales has been the College’s President. Due partly to the vision of its founders and Grove its first Director, the Royal College of Music’s collections are now of international significance. This rich heritage comprises material dating from the 15th-century onwards, including music manuscripts, early printed music, concert programmes, portraits, photographs, film scores, diaries, musical instruments from all over the world, as well as modern repertoire and literature. There are at least 800 musical instruments, 300 original portraits, 10,000 prints and photographs comprising the most substantial archive of images of musicians in the UK, and some 600,000 concert programmes, which document concert life from 1720 to the present day. Aside from the educational impact for members of the RCM community, by which I mean staff, students and guests, the archival, historical, documentary, social and cultural significance of these treasures is considerable. It’s true that people are treasures too and the RCM’s list of alumni is indeed distinguished, including the late Dame Joan Sutherland, Benjamin Britten, Sir Thomas Allen, Michael Tippett, Dame Gillian Weir, Sarah Connolly, three members of the Lloyd-Webber family, Gervase de Peyer, Ralph Vaughan Williams, Rick Wakeman, Roger Vignoles, Trevor Pinnock and Mark-Anthony Turnage, just to name a few. But to continue, I’d like to share some of my colleagues’ favourite treasures with you. The baryton by Magnus Feldlen of Vienna dates from 1647 and is considered to be the oldest surviving instrument of its kind. The baryton is a fretted, bowed string instrument, resembling a bass viol. In addition to the bowed strings are several sympathetic strings. The most famous composer to write for the instrument was Joseph Haydn, whose patron Prince Nikolaus of Esterházy played the baryton. The instrument flourished only from the mid 17th until the early 19th century, and even then, it was not really known outside Southern Germany and Austria. Josef Haydn is well-represented amongst the RCM’s treasures, including his manuscript of the first of the op. 64 String Quartets, in C major, dating from 1790. This work is amongst the so-called Tost Quartets, composed for the Viennese violinist Johann Tost. In this slide you can see Thomas Hardy’s 1791 portrait of Haydn which has been reproduced in many studies of the composer. This painting was exhibited at the Royal Academy in 1792. Between 1790 and 1795 Haydn made two visits to London, under the auspices of the impressario Johann Peter Salomon. Salomon’s portrait was also painted by Hardy, and hangs near the one of Haydn in the RCM’s Museum of Instruments. An instrument which almost certainly spent its pre-RCM life in a domestic rather than a concert setting is the square piano by Collard & Collard. Made in about 1840, this mahogany piano was purchased by the RCM in 1965 and restored by Derek Adlam in 1969. The firm of Collard & Collard was run by two brothers, William Frederick and Frederick William. They enjoyed relative commercial success, and worked with the pianist, composer and maker Muzio Clementi. Following Clementi’s death in 1832, the Collards assumed sole responsibility for the firm. Square pianos, horizontally strung, were most popular in the 18th and early 19th centuries. In 1810 over 80% of pianos made here in London were squares, but by 1850 this figure was only 7%, as improved upright pianos captured the domestic market. They were more able to accommodate a larger keyboard range in their frame, within which the strings were arranged vertically. The tenor trombone played by the teenage Edward Elgar was made by Boosey & Co. in about 1875. The bell of the instruments is inscribed thus: ‘This instrument on which Sir Edward Elgar played as a boy has been kindly presented by him to the Y.M.C.A. music section’. The RCM received it as a gift from the Ealing & District Y M C A in 1934. Apparently Elgar was not the most proficient of trombonists, so it’s appropriate his legacy is also represented in the RCM Collections by the manuscript of his cello concerto op. 85 in E minor. The work, which dates from 1919, was issued in facsimile by Bärenreiter in June 2007, to celebrate the 150th anniversary of Elgar's birth. I rather like Bartolommeo Nazari’s 1734 signed and dated portrait of the castrato Farinelli at the height of his fame. The painting was commissioned by William Capell, third Earl of Essex during his tenure as British Ambassador in Turin. In 1734 Capell was negotiating for Farinelli to perform at the opera season here in London, at the King’s Theatre, Haymarket. The resultant performances were a triumph for the castrato, both musically and financially. Farinelli, born Carlo Broschi, in Bologna in 1705, was 29 when this portrait was painted. He went on to become the most celebrated castrato of his day. According to a report in Johann Friedrich Agricola’s ‘Introduction to the Art of Singing’ of 1757, Farinelli was in the habit of eating one uncooked anchovy before he sang! Other RCM treasures include a letter from Ludwig van Beethoven to the composer and publisher Anton Diabelli, written in the spring of 1823. The letter concerns the necessary proof-reading and copying of the 33 variations on a waltz by Diabelli, prior to the work’s publication. We also have one of the surviving manuscripts of Chopin’s Waltz in Db op. 64/1, the so-called ‘Minute Waltz’. Composed in 1847 the work was published by Breitkopf and Härtel of Leipzig that same year. The survival of more than one manuscript version of this, as well as some of Chopin’s other music, suggests something of the improvisatory nature of his performances. Perhaps we have lost a little of the spontaneity this implies, with our often slavish adherence to the printed text or score. These items are treasures indeed but, in my opinion, the most consistently exquisite, significant and valuable holdings came to the Royal College of Music thanks to the vision and generosity of Sir George Donaldson. Here’s Donaldson in a portrait by Frederick Sandys, painted in 1878, when Donaldson was 33 years old. George Hunter Donaldson was born in Edinburgh in 1845. The Oxford Dictionary of National Biography tells us little of his early life but that he settled in Paris in the late 1860s, where he nurtured his interest in historic furniture and works of fine art. He returned to England in 1871, establishing himself as an art dealer here in London, in New Bond Street. Donaldson’s business remained there until his retirement in the 1890s. Testimony to Donaldson’s wealth was the property he accumulated or rented, in the UK and Europe from the mid-1880s. Upon retirement he settled in Hove, East Sussex, whereupon he opened his own museum! Donaldson was decorated by the Grand Duke of Saxe-Coburg and Gotha in 1885, the Légion d'honneur in 1892 and in 1904 by Edward VII, with a knighthood. He died in 1925 at his home in Hove. Donaldson’s interests, both professional and private, included musical instruments. He gave his personal collection of these to the Royal College of Music in 1894, a gift which deliberately coincided with the opening of the new Blomfield building. Donaldson wrote and published a catalogue of instruments, for private circulation only, which included photographs and brief descriptions of each instrument. The title page declares it to be ‘a Catalogue of the Musical Instruments and Objects forming the Donaldson Museum presented to His Royal Highness The Prince of Wales KG President of the Royal College of Music on May 2nd 1894 to form the Permanent Museum of that Institution’. Donaldson himself was allowed to decorate the room in which his instruments were displayed, and his additions included a minstrel’s gallery from Siena and coffered ceiling. These features remain to this day in what is now the reading and reference room of the Royal College of Music Library. Donaldson continued giving to the College and, as we will discover soon, this included treasures other than musical instruments! Amongst the keyboard instruments Donaldson gave the RCM is an instrument called a clavicytherium which you can see in this slide. This instrument is regarded as the earliest known stringed keyboard in existence, and was one of Donaldson’s 1894 gifts. The clavicytherium dates from the period 1480-1500, and was most likely made in Ulm in southern Germany. It is neither signed nor dated. Think of the instrument as an upright single-strung harpsichord, with an outer case. The clavicytherium had previously belonged to the wealthy Contarini family of Venice. The city of Ulm had close trading links with Venice, so it’s possible there was contact between the makers and the Contarinis. Then, it passed to Count Pietro Correr, onetime ambassador of Venice to the Austrian Empire. In 1885, Correr loaned it to the International Inventions Exhibition in London, of which Donaldson was one of the organisers. There’s a seal on the outer case of the clavicytherium which is probably a customs stamp from what was the instrument’s final journey, from Correr’s residence near Venice to London. Other musical instruments collected by Correr now form an important part of the extensive holdings of the Museum of Musical Instruments in Brussels. The English keyboard player, maker and restorer Derek Adlam has approximated a range or compass for the clavicytherium, including 2 pedal notes tuned according to need. The sophistication of the instrument’s design and craftmanship bears witness to an already established tradition of making such specimens. Sadly, woodworm infestations have rendered the instrument beyond playing condition and it cannot be subject to constant scrutiny. Nonetheless, a playable reproduction was made in 1973. We will now hear a recording made on this reproduction instrument, of an anonymous work entitled ‘Sequitur tenor generis maioris …’ from the Buxheimer Orgelbuch, c. 1470. The recording was made in 1997 by Richard Gowman, who was an assistant in the RCM Museum. The next slide features three of these, all given by Donaldson in 1894. Moving from left to right we start with a treble recorder by Jakob Denner from early 18th-century Nuremberg. This ivory instrument is elaborately decorated, suggesting something of the importance of the person for whom it was made. The Denner family was the largest in the Master guild of Wildruf- und Horndreher, makers of game/hunt whistles used as calling or luring devices, and turners of bone and animal horn. Musical instruments by the Denner family were exquisitely crafted and highly sought-after. In 1784 Christian Friedrich Daniel Schubart wrote that ‘their flutes are famous throughout the whole world. They reached as far as Constantinople and Ispahan, even via missionaries to China’. The workshop established by Jakob Denner’s father, Johann Christoph, has been credited with the invention of the clarinet. However, we cannot be sure of this, since no clarinets by J.C. Denner survive. None the less, it is likely that experimentation in the workshops of Denner, Johann Wilhelm Oberlender father and son, and Johann Georg Zick, during the late 17th and early 18th centuries, was motivated by the recognition of the recorder’s inability to cope dynamically within the developing orchestral medium. The instrument in the middle is a clarinet, slightly later but not dissimilar to those the Denners were making. Made of ivory, this two-keyed clarinet is by Georg Heinrich Scherer of Butzbach, central western Germany, and dates from about 1740. One silver key is visible at the front and there is another on the reverse. Clarinets with two keys are the earliest form of that instrument, and appear in music by composers as celebrated as Georg Friderich Handel, Jean-Philippe Rameau, Georg Philipp Telemann and Antonio Vivaldi. Another rare instrument by Scherer, a one-keyed flute, also in ivory, was given to the RCM by Donaldson. Donaldson certainly collected in Paris and Italy and it’s likely that these two rare Scherer instruments were sold together. In the mid 1980s his grandson is reported to have said that Donaldson would ‘go anywhere to buy an instrument he wanted’! The last instrument on this slide is another treble recorder from Nuremberg, dating from the mid 18th century. The Oberlender workshop was typical of most at this time, and, in addition to clarinets and recorders, was known to have made flageolets, flutes and oboes. Three basset horns allow us a glimpse of this unusual member of the clarinet family, and favourite of Mozart’s. These instruments were made in Vienna and in Prague, and thus represent the two most important centres of basset-horn making. This slide shows two of the three known shapes of basset horn. The anonymous instrument on the left, whilst the least common amongst surviving specimens today, is the same design as the basset clarinet on which Anton Stadler performed Mozart’s Clarinet Concerto. Sadly Stadler’s instrument and Mozart’s manuscript are both lost. The instrument in the middle, shown in colour, was made by Raymund Griesbacher, who played the basset horn himself, often in trios with Stadler. He was based in Vienna. Instruments from the workshop of Franz Doleisch, in Prague, were all date stamped which makes it easier, some two hundred years later, to know exactly which music fits best. Unfortunately, this instrument is missing a bell and mouthpiece. For evidence that Donaldson was a man with both taste and money we need look no further than his gift to the RCM of one of the greatest treasures of the collections, and indeed one of the most important music manuscripts in the UK. Wolfgang Amadeus Mozart wrote 27 piano concertos. Thanks to Donaldson, the manuscript of Mozart’s Concerto no. 24, in C minor, first catalogued in the 19th century by Ludwig Ritter von Köchel as K491, is here in London. Mozart is without doubt the most celebrated composer of Western Art music. His prolific output and early death have contributed to this status, and the consistent quality, breadth and inventiveness of his music remains unsurpassed. How did the Royal College of Music end up with such a priceless treasure, by such a famous composer? The manuscript of the C minor piano concerto was sold by Mozart’s widow Constanze to the music publisher and dealer Johann Anton André of Offenbach-Am-Main. In 1800 André issued authoritative editions of ‘Six Grand Concertos…’, as opus 82. This opus included Mozart’s concertos numbers 21, 22, 23, 24, 25 and 27; namely K467, K 482, K 488, K 491, K 503 and K595. André’s publication helped ensure that Mozart’s piano concertos entered the repertoire at a time when keyboard virtuosity and keyboard instruments were both progressing at an exponential rate. Beethoven admired K491 and Felix Mendelssohn performed it during the 1830s and ‘40s. The manuscript of K491 then passed to Johann Baptist Streicher, of the firm of Viennese piano makers, and son-in-law of André. Then, in 1856, according to Donaldson, the manuscript was purchased by Otto Goldschmidt, the German-born conductor and pianist, and husband of the soprano Jenny Lind, who was one of the first singing professors at the RCM. Two years later, in 1858, Goldschmidt settled in England and brought his Mozart manuscript with him. Put up for auction by the firm of Puttick and Simpson for Goldschmidt, the manuscript was bought by Donaldson, who gave it to the RCM in 1894. I agree with Denis Matthews, who in his critical introduction to the first facsimile of the work, published in 1979, wrote: ‘the autograph of a much-loved masterwork is liable to have a sentimental appeal quite apart from its intrinsic musical value’. Mozart’s own handwritten thematic catalogue records his works from 1784 until 1791. The entry for 24 March 1784 reads: ‘a clavier concerto accompanied by violins, violas, 1 flute, 2 oboes, 2 clarinets, 2 bassoons, 2 horns, 2 trumpets, timpani and bass. It is likely that Mozart himself premiered the work on 7 April, at the Burgtheater in Vienna. Three weeks before this concerto, Mozart had written the A major concerto, K488, and, a little over one month after the composition of K491, he wrote his opera The Marriage of Figaro. This gives us an indication of his compositional speed, one which is confirmed by the actual manuscript. Mozart’s reputation for relatively neat and tidy manuscripts was to blame for the longstanding misconception that he wrote his music off the top of his head. At least the manuscript of K491 goes against that trend, as its often untidy, with lots of alterations and deletions. In works where he was the intended soloist, Mozart often left passages quite bare, knowing that, in performance, he would improvise or decorate as he felt appropriate. The current slide features the first of two pages from the manuscript that I’ll show you tonight. This page is from the end of the first movement. You can see the words ‘Dal Segno’ as well as four faces that Mozart has drawn. This indicates that here, in the Coda, Mozart wants to reuse material from bars earlier in the movement, where, incidentally he drew another little face on the score! Note also the rapid semiquaver figuration on the penultimate stave of the page. The second page is taken from the opening of the third movement, not far in from the page on the postcard you have been given. You can see, in the lower right hand part of the page, many crossings-out, making deciphering this difficult at first glance. The piano right hand starts on the 4th stave from the bottom, and then, three bars before the end, continues back some bars on the 6th stave up! I’ve bought my own copy of the facsimile with me this evening, so please come and have a look at it after the lecture if you’d like to. Simon Keefe, in The Cambridge Mozart Encyclopaedia of 2006 describes K491 as ‘even by Mozart’s extraordinary standards… one of his greatest instrumental works’. Let’s now hear an excerpt from the beginning of the third movement. In this recording, made for EMI Classics in November 1990, we hear soloist and RCM alumnus Melvyn Tan, with The London Classical Players, conducted by another RCM alumnus, Sir Roger Norrington. Tan is playing a fortepiano made by Derek Adlam after the Viennese maker Anton Walter. K491 is one of only three piano concertos by Mozart to include clarinets in the orchestra. In this recording, the principal clarinet is none other than the current Director of the Royal College of Music, Professor Colin Lawson. One of the most recent treasures acquired by the Royal College of Music is the oldest known English-language instruction book for the clarinet, entitled The Clarinet Instructor. This treatise, tutor or method book, was purchased by the RCM late last year, and predates, by eight years, a similar publication housed in the British Library. Whilst the two tutors are quite similar, the RCM tutor’s date of circa 1772 marks it as a holding of great significance. This item came to the College from a book dealer in the American state of Massachusetts, in a volume which contains another clarinet tutor as well as a collection of music. The Clarinet Instructor is the first tutor bound in the volume. This next slide shows the first page of actual music for the aspiring clarinettist to practise. Clarinet tutors of this kind have been issued since the late 18th century, catering for a growing market of amateur players. The sentiments of The Clarinet Instructor continued to be reproduced, with ever so slight variations, into the 19th century. However, by the 1820s, new methods were written to accompany new instruments with greater amounts of keywork. The directions given in this tutor are of a relatively literal and simple nature, which may point to a different, perhaps even amateur readership in comparison with contemporary methods by Continental writers. They might also suggest, however, that such instruction books were used by performing musicians already competent on another instrument. I’ll now play two of these pieces on a six-keyed clarinet pitched in C. This instrument was made in London, in the workshop of Goulding & Co in about 1800. The largest number of surviving six-keyed clarinets is by English makers, and the majority of these were made in London, from 1785 onwards. In celebrating the past let us salute the vision of Sir Thomas Gresham which resulted in the establishment, in 1597, of Gresham College. The first Gresham Professor of Music, John Bull, was appointed by Queen Elizabeth I herself. An account of Bull is contained in another of the RCM’s treasures, a manuscript copy of a lecture entitled ‘The History of the Gresham Professors of Music – Dr. John Bull’ given in 1838 by the then Gresham Professor of Music, Edward Taylor. Taylor was born in 1784 and worked across theory and practice; writing, speaking, performing as a bass, training choirs and also playing wind instruments. Manuscript copies of three of his Gresham lectures are part of the RCM Collections. Dr. Bull had graduated in music at Cambridge, and was admitted afterwards to the same honour at Oxford in 1592. 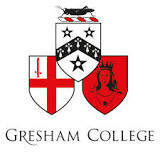 Five years after this time the patriotic and munificent intentions of Sir Thomas Gresham were carried into effect, and Gresham College was opened to the public. The other professors were named, at the request of the Gresham Committee by the Universities of Cambridge and Oxford: but the appointment of the musical professor was referred to Queen Elizabeth, and her Majesty was pleased to confer it on Dr. Bull. This was not an empty compliment paid to the Queen as Queen but a judicious appeal to a competent judge. All the Gresham Lectures were originally directed to be delivered in Latin as well as in English: chiefly it seems, that foreigners as well as natives might profit from them. From this double duty Dr. Bull was specially exempted. Bull resigned his Gresham Professorship – for what reason does not appear: as he did not quit England till several years afterwards… During the reign of Elizabeth, favours and honour, reward & renown attended the English Musician: the example of the Queen was imitated by her Nobles, & fashion as well as good taste was enlisted in support of the art. But – as I have before intimated – no sooner had James succeeded to the throne, than the blight of neglect passed over the luxuriant field of English Vocal Harmony: the caprice & indifference of the Court infected those who surrounded it. No wonder that our Professor should have regarded England as no longer the fit residence for him: & that having witnessed the respect paid to musical talent in the Netherlands, he should have determined to exchange neglect & proscription here, for honour & profit there. No wonder that he should have declined to serve under those French favourites upon whom, as a Musician, he must have looked down with unmeasured contempt, & have chosen, as a fitter residence, a Country in which his talents would be estimated at their real value. “Dr. Bull”, remarks Burney “has been censured for quitting his establishment in England: but it is probable that increase of health & wealth were both the cause & the consequence. He was praised, indeed, at home: but not adequately rewarded: and it is no uncommon thing for one age to let an artist starve, to whom the next would willingly erect statues. The professorship of Gresham College was not then a sincecure. This and his other situation were not lucrative appointments for the first performer in the world: and those other means of increasing his income which are now within the reach of the Composer or performer, were not then open to this wonderful Musician”. Our Professor’s instrumental productions are not likely to commend themselves to the acceptance of a modern & mixed audience. They are rather to be studied & appreciated by the few, than enjoyed by the many. The article on Bull in Grove’s first dictionary of music, from 1879, was written by Edward Rimbault Esq., one of England’s earliest self-confessed musicologists. Rimbault admits to a certain amount of ‘conjecture’ in recounting the life of John Bull. The late Susi Jeans’s article on Bull, in the current edition of Grove, sheds further light on his life. Bull was quite poor and made numerous petitions for money to Queen Elizabeth. The Gresham Chair, with free accommodation and a regular salary, was therefore, a most welcome appointment. Scant information is known about Bull’s university career but, as a member of the Chapel Royal and a musician of some standing, he did not need to attend matriculation at Cambridge. Together with the fact that he did not need to reside in Cambridge to take a music degree, this may account for Bull’s dispensation to lecture only in English, the language in which he conducted the majority of his professional life. We now know that impending fatherhood and marriage, in that order, meant that Bull had to resign the Gresham Chair, leaving him to find new lodgings and income. Oliver Neighbour, who assesses Bull’s compositional output in the latest Grove, suggests that his music was of most interest to historians, most of it remaining unpublished till the appearance of the Musica Britannica series, which began in the 1950s. In conclusion let us remember Sir Thomas Gresham and his ‘new learning’. Gresham’s concept complemented the learning offered at Cambridge and Oxford which was in two parts, the Trivium (grammar, rhetoric and logic) and the Quadrivium (a higher level, comprising the study of astronomy, geometry, mathematics and music). Gresham’s vision recognised the importance of more explicitly hands-on, almost vocational learning. This strong symbiosis of theory and practice is certainly crucial to musical learning in the 21st century. Likewise, education and training are distinct and valuable components of learning, for the edification of individuals and nations. Thomas Gresham’s new knowledge was not just for gentlemen scholars but for tradesmen, merchants and ships’ navigators. Indeed, this initiative accords with the very principles behind the founding of the Royal College of Music. It’s not hard to notice the rhetoric of social and civic responsibility behind the current UK government’s Big Society programme. In order truly to help people, and I quote, “to come together to improve their own lives” we must invoke the learning of the past, especially that which is preserved in treasures left to us by previous generations. We must continue to safeguard these treasures assiduously, passionately and substantially, in this primarily temporal and fiscally-referenced climate in which we now live. John Bull’s life has lessons for us in the 21st century. Edward Taylor’s assessment of Bull’s music reminds us that art is primarily not, and should never be, created for the uncritical, unthinking masses. Mozart’s piano concerto in C minor is not blighted by a necessity to pander to public taste. Well-crafted musical instruments are revelatory far beyond mass-produced specimens. It’s essential also to acknowledge the gestation period of works of art, and that, with the ever-increasing impact of globalisation and technology, the meaning and value of objects continues to change, and with these, their reception. Indeed, celebrating the past, through some of the Royal College of Music’s treasures, presents us with the opportunity to question the current homogenisation and democratisation of art, culture, and indeed society as a whole, brought about by new forms of mass media technologies. As Thucydides wrote, in his History of the Peloponnesian War, recounting the 5th century BC conflict between Athens and Sparta, ‘Men make the city, and not walls or ships without men in them’. A truly Big Society is one where we all participate, both individually and collectively, in the exchange of learning. The wellbeing of society begins with the wellbeing of individuals. The treasure within each individual must be nurtured and safeguarded, and only through the interaction of human and other treasures can society realise its full and true potential. In conclusion I would like to thank Professor Sir Roderick Flood, Provost of Gresham College, and the Council of Gresham College for the invitation to deliver this lecture.